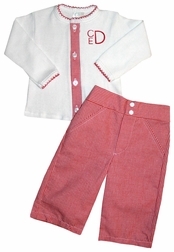 Love this adorable white knit 2 piece outfit for baby boys by Paty Inc wonderful for Christmas and the holidays. The top has a red gingham button placard down the front. The pants are red gingham to match. Perfect for monogramming!